Main Setlist: Paper Plane, Softer Ride, The Wanderer, Proud Mary, Fun Fun Fun, Backwater, Mystery Medley, Gerdundula, Get Back, Get Out of Denver, Whatever You Want, In the Army Now, Somethin'bout you Baby I Like, Don't waste my Time, Rockin'all over the World, Roadhouse Blues, Caroline, Anniversary Waltz incl. Bye Bye Johnny. 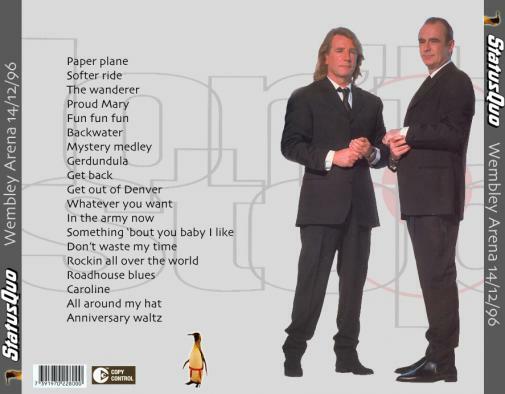 Additional songs performed: All around my Hat in the UK Setlist with Maddy Prior on guest vocals. Tour Crew: Peter Hillier (Tour Manager), Andy Taylor (Sound Engineer), Dave Salt (Stage Manager/Bass Tech), Simon Rossi (Band Personal Assistant), Andrew Carman (Drum Tech), Pat Marks (Lightning Designer), Tim Franklin (Monitor Engineer), Alan "Tonto" Jhowry (Guitar Tech), Bryan Wilson (Rigger), Ben Leach (Backline), Marcus Viner (Video Operator), Julie Devine (Wardrobe), Alf Weaver (Security) Merchandiser: Niceman Europe Ltd. Management: Handle Group of Companies Manager: David Walker. Tour Notes: the first ever Tour in Poland, also USA, Japan & Australia back on the map. 21 shows cancelled due to problems with promoter, french lorry drivers strike, Francis flu (Plymouth 11.12.1996) and Rick's heart surgery (Summer of 1997). 07/12/ UK, Glasgow - S.E.C.C. 18/12/ UK, Birmingham - N.E.C. 19/12/ UK, Birmingham - N.E.C. 20/12/ UK, Bournemouth - B.I.C. 21/12/ UK, Bournemouth - B.I.C. 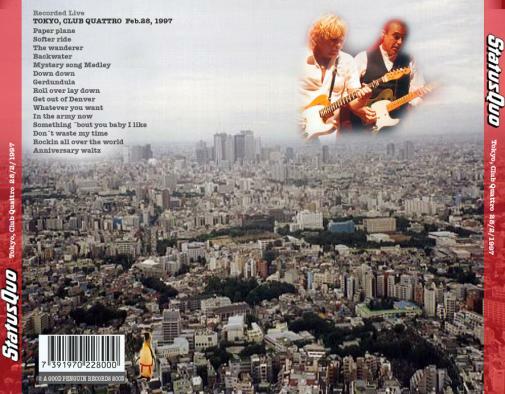 24.02.1997 - the band set off to Japan for the first tour in more than 20 years. 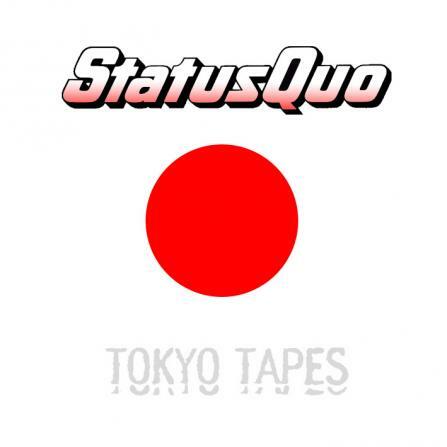 Status Quo's first concert kicked off in Japan at the Shibuya Public Hall of Tokyo on 27.2.1997. 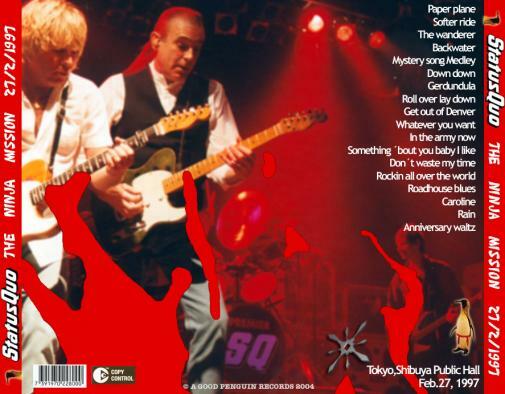 2 more shows were played in Japan. 04.03.1997 - also the first australian tour in more than 20 years started at the Twin Towns Service Club. 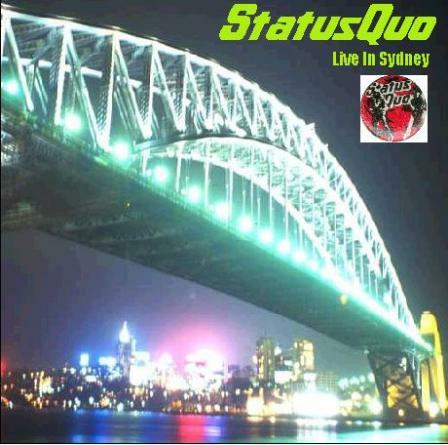 A total of 7 concerts were played in Australia. 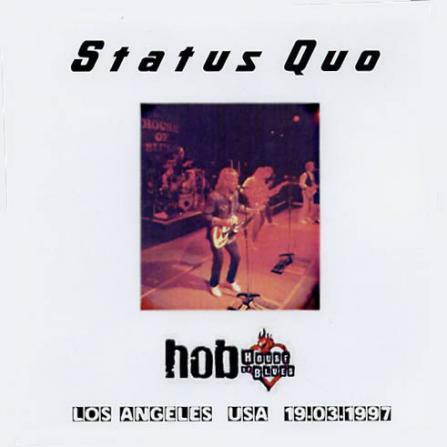 19.03.1997 - Status Quo in the USA/North America: the House of Blues, Los Angeles saw a rocking Status Quo and it was followed by a show in Toronto,Canada at the 21st March and one show in New York at the 22nd March. 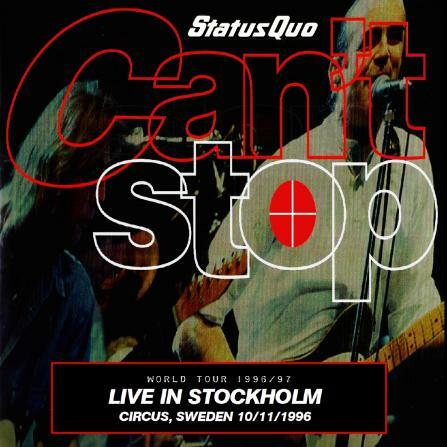 30.04.1997 - the shock; Rick Parfitt with an quadruple by-pass emergency operation. All scheduled concerts had to be cancelled. 30.07.1997 - opening of Sunderlands new football stadium - "stadium of light". 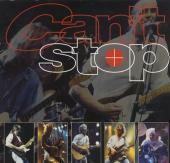 It was the first time that Rick Parfitt was back on stage since his quadruple bypass operaton way back in April 30. 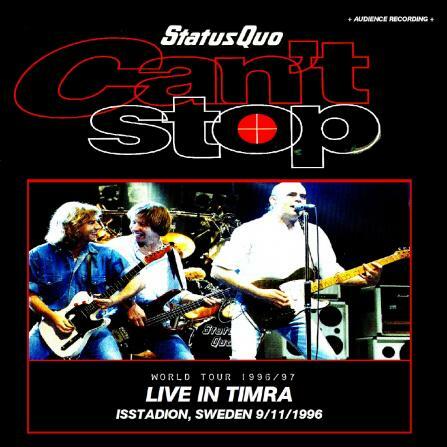 Status Quo played a shorter set. 02.08.1997 - one of the most important concerts in Status Quo's long career took place at the football-ground of Norwich FC, "Carrow Road". 15,000 fans turned up to see the first full show of Rick Parfitt after his quadruple heart bypass.